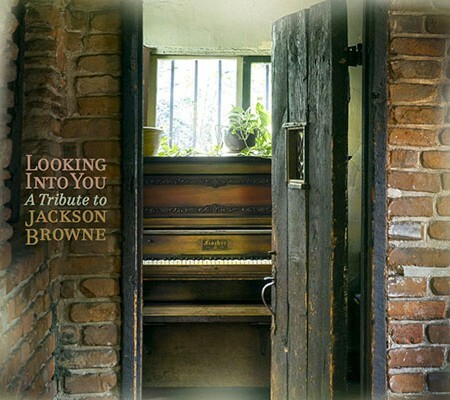 With Looking into You: A Tribute to Jackson Browne, almost two dozen singers, spanning generations and genres, illustrate the timelessness and power of the legendary songwriter’s work. A longtime passion project spearheaded by businessman and music executive Kelcy Warren, the album includes interpretations of Browne’s songs by some of his most celebrated peers (Bruce Springsteen & Patti Scialfa, Bonnie Raitt, Don Henley) and by performers influenced by his recordings (Ben Harper, Lyle Lovett, Joan Osborne). Though Browne is one of the most celebrated artists of his time—an inductee to both the Rock and Roll Hall of Fame and the Songwriters Hall of Fame, with over 18 million records sold in the US—Warren felt that his work was deserving of more immediate recognition. Last summer, Warren brought Grammy-winning producer Tamara Saviano (who had previously worked on tribute albums honoring Stephen Foster, Kris Kristofferson, and Guy Clark) on board, to help conceive and organize the project. The first artist she contacted was Browne’s friend and colleague Don Henley, who instantly said yes, choosing to record the landmark “These Days” as his contribution, accompanied by acclaimed young band Blind Pilot. With a catalogue as expansive and diverse as Jackson Browne’s, ranging from songs of intense personal emotion to ambitious political statements, the artists made their choices for a variety of reasons and relationships to the music. “Growing up in Mississippi, Jackson Browne’s music was a big part of the soundtrack of my youth—‘Doctor My Eyes’ was all over the radio, and it really stuck in my head,” says Paul Thorn. Shawn Colvin, who recorded “Call it a Loan,” says “I’d do this song if only for the chorus—it’s quintessential Jackson, summing up about a million emotions elegantly into four lines.” The results include some surprising takes on such classic material. Bruce Springsteen and Patti Scialfa offer a Spanish-inflected version of “Linda Paloma”—a song Springsteen singled out when inducting Browne to the Rock and Roll Hall of Fame in 2004—while Bruce Hornsby brings a bluegrass feel to “I’m Alive.” Lucinda Williams’s reading of “The Pretender” is almost painfully intimate. “That’s the mark of a great songwriter,” says LaFave. “The songs are so well-structured, you can cast them in different lights.” Lyle Lovett, meantime, ended up contributing both “Our Lady of the Well” and “Rosie” because he couldn’t decide between the two.